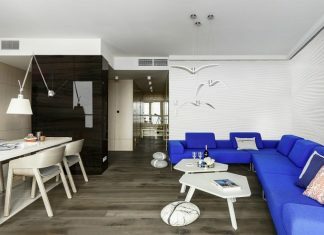 Roohome.com – Finding a creative design for a modern apartment looks luxurious is not difficult anymore. This is because a progress of furniture is increasingly creative and luxurious. The arrangement of furniture and the arrangement of color must be a good match in producing a perfect result. 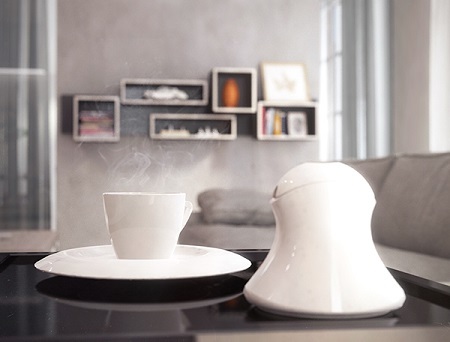 Now, you will not waste your time to think a suitable design for a modest apartment. Having a modest apartment in the middle of the city might tribulate some people nowadays. 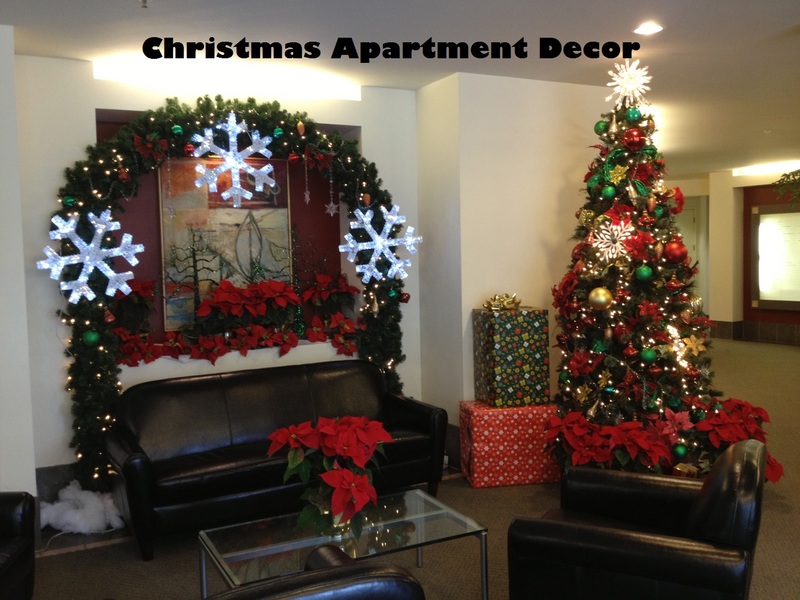 They get difficult to decorate their apartment becomes cozy yet luxurious. 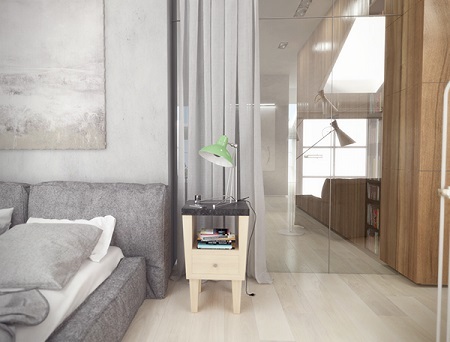 Fortunately, Pavel Pisanko has a brilliant idea to make your dream apartment come true. 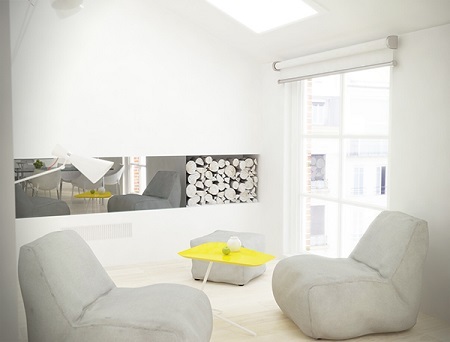 He uses a suitable color to create a new shade inside of an apartment. Besides that, he will never forget all creative furniture which is chosen by him. 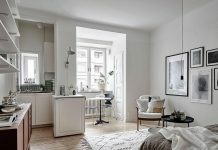 First, in a living room, he chooses dark gray, light gray and white to be the main of color to this apartment. The reason is that these colors are reflecting the shade of luxury and modern. 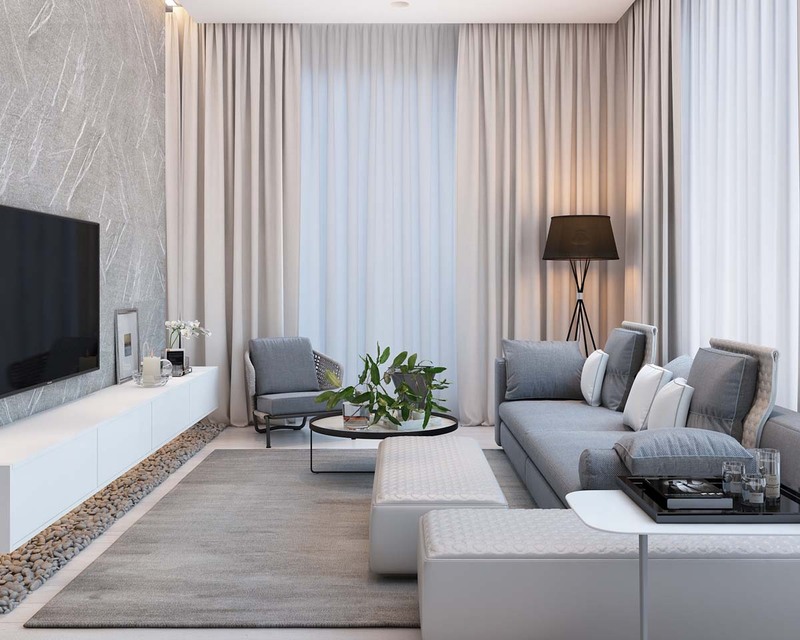 Afterward, the arrangement of some furniture in this room is very nice such as a light gray curtain, a dark gray sofa, and book shelf which is hung on the wall. A whole wall in this room is painted by a gradation gray and white. 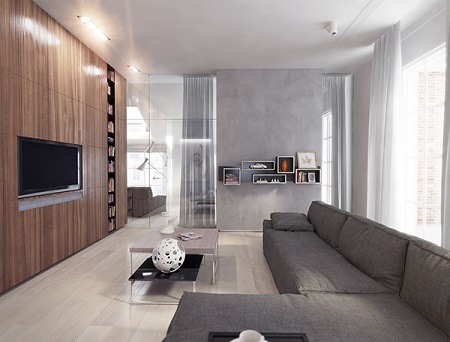 Interestingly, there is no space for television but he puts the television on the wall. He uses the wood pattern to give an artistic view in this room. Before moving to the dining room, there is a corridor to connect the dining room. This space is part of open floor space which connects to the kitchen and relaxes all in one. 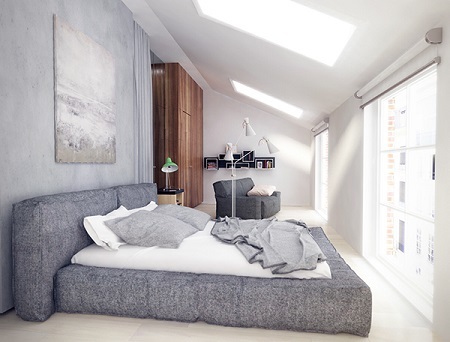 The arrangement of color for this room focus to light gray only. 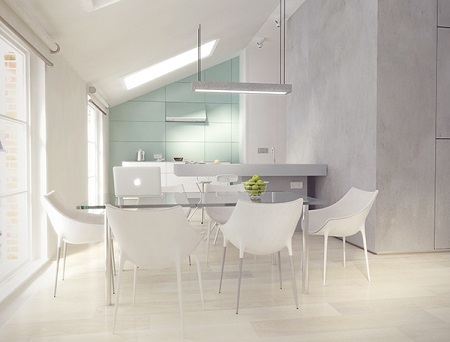 Light gray is painted to the kitchen counter and dining chair. Yet, for dining table Pavel Pisanko uses glass. 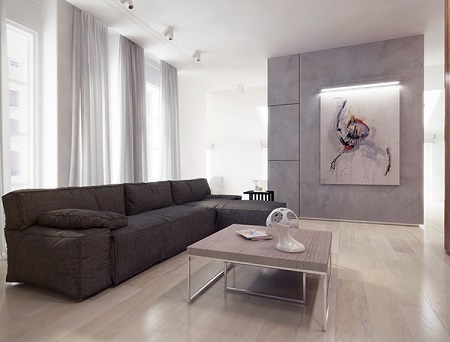 Is a creative design for a modern apartment here is suitable for you? For the bedroom, the arrangement for all furniture including bedstead, floor standing lamp, and wardrobe are designed lengthways. 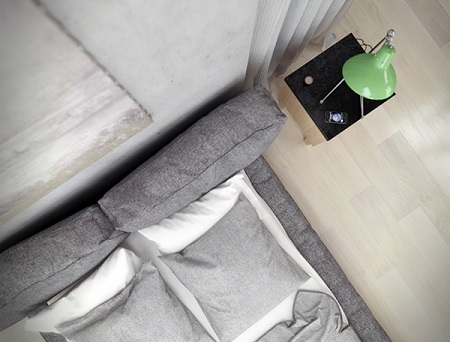 The bedstead itself is chosen with gray and white. The opposite from bedstead there is a dark gray sofa against the window. This space is decorated with book shelf which is hung on the wall as well. The point of this room is wood material for the wardrobe. 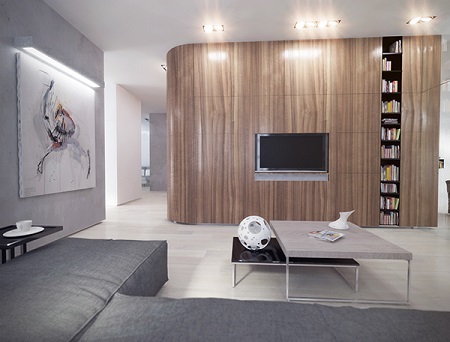 Pavel Pisanko selects wood material for two different spaces, the first in the living room and the second in a bedroom. 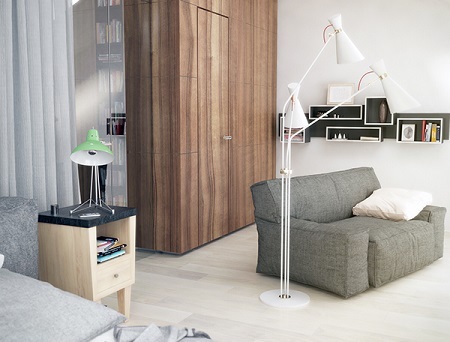 Another furniture which inspires you as well is a wood nightstand that is decorated with a green lamp above it. 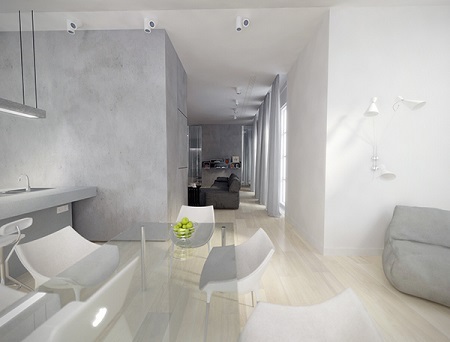 Now, it is your turn to try this a creative design for a modest apartment looks luxurious. Get this amazing design which inspires you to build a new shade in your apartment. If you want to find other awesome design, you can visit and check here.